She was a soft target from the start. The young sow, possibly one of last year's cubs, lay exhausted in the wire snare that now pulled tightly around her hind quarters. She had spent many hours during the night trying to free herself. Her night's work was clear to anyone passing by. The fresh mud that covered her striped face bore testimony to her gallant efforts. The loose earth, softened after the previous day's torrential rain was scattered around the perimeter of the hole she had been excavating. It was her final bid to free herself of the snare, but it had all been in vain. Now she had given up, too tired and too weary to go any further. Instinctively, she knew her life was over. She lay with her head resting on one of her front paws and awaited the shot that would end her young life. Her small carcass would then be bagged, tagged and casually tossed into the back of the trapper's vehicle along with the rest of the morning's carcasses and taken away for autopsy. Far from being an illegal wire snare, set by the local lowlife, this was in fact a very legal and sanitised exercise. 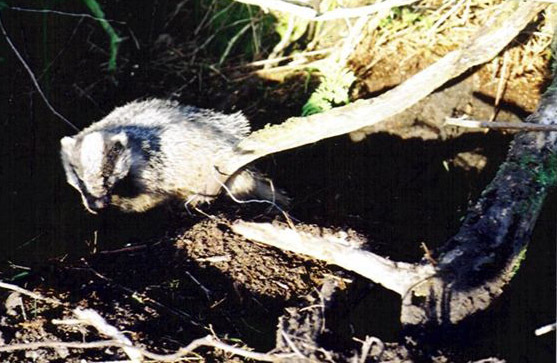 Ireland's Department of Agriculture and Food (DAF) had secured the necessary licence from The National Parks and Wildlife Service to snare and shoot badgers. Now she was merely one more badger to be added to the list of almost 50,000 casualties that DAF have killed during the past fifteen years or so for their alleged role in the spread of Tuberculosis to cattle. Later that morning passers-by would halt and look at the spot. Among the bluebells and primroses, the sunshine picked out the small pool of blood in the clay. It told its own tale on that summer morning in May, 2005. PLEASE SIGN BADGERWATCH'S PETITION TO HALT THE SNARING OF BADGERS By Ireland's Department of Agriculture and Food.